Apple was awarded $1.05 billion in damage yesterday when a jury found that Samsung mobile devices infringed on six Apple patents. Of course, the crux of Apple’s complaint was how Samsung has been churning out phone after phone that not only infringe on their patents, but appear to be outright iPhone knock-offs. 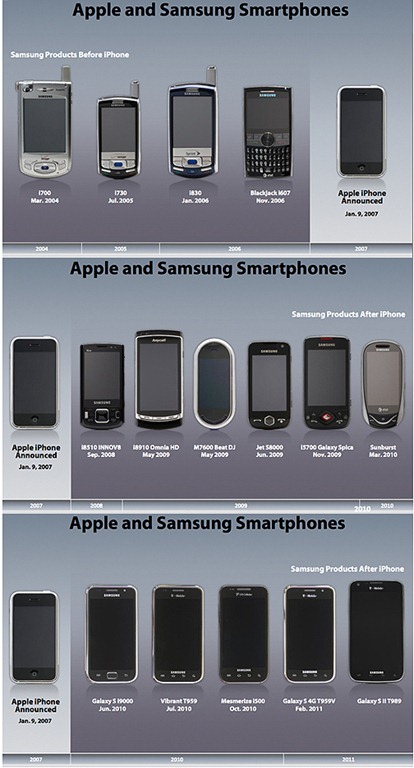 For those who don’t believe Samsung blatantly copied Apple’s iPhone, this picture says it all. Take a look at the phones Samsung created before the iPhone was announced in January of 2007. Samsung then spent the next two years designing their phones to look like the iPhone, but they hadn’t quite perfected the process. I suspect many of these phones would have been in the design phase around the time the iPhone was released giving Samsung very little time to pivot towards the Apple design. But the last panel shows that by mid 2010, Samsung is building phones that could pass for counterfeit iPhones on the streets of New York. That’s not innovation. That’s not borrowing or being influenced by other’s designs. That’s Samsung firing up their copy machines. One must be completely blind to not to see this. This has nothing to do with Android. This is Samsung riding the coattails of Apple’s most successful product, and intentionally trying to confuse consumers. The jury has spoken. I’m sure Samsung will fight this as long as they can through the appeals process. But their reputation as a company that intentionally copies Apple products is cemented in history. Any new product Samsung releases going forward will be scrutinized against this verdict as well it should. One thought: If Samsung is eventually compelled to license patents from Apple, it’s possible that Android could generate more profits for Microsoft and Apple than it does for Google. If I were a Google shareholder that would not make me happy. We already know that Google earns four times the revenue on iOS search compared to search on Android. But that could be winding down as Apple seems hell-bent on replacing or removing Google services that ship with the iPhone. Given that Samsung is arguably the only Android OEM making any money building Android phones, one could say that the Android business model works best for two companies that don’t produce Android phones.